This basket has a diameter of about 8.5 in, a height of about 1.5 in and a Net WT of 1 pounds. This hand-woven willow basket is filled with some of the tastiest and best Nuts you can munch on: Giant Whole Cashews, Colossal California Pistachios, Superior Mixed Nuts, Delicious California Almonds and Honey Roasted Extra Large Virginia Peanuts. Our handsome woven basket is divided into generous compartments and when the Nuts are gone, this reusable tray is handy for storage or display. Superior Nut Company - Nut Gift Basket - Net Wt. 1lb. Cashews, Almonds, Pistachios, Macadamias, Peanuts, Peanut and/or Cottonseed Oil, Sucrose, Honey, Xanthan Gum, Salt. Very easy transaction for a gift. The company kept me informed of the progress my gift was making. When it was delivered I got a delivery confirmation. I will use this company again. Gave nut baskets for Thanksgiving and got rave reviews. Cannot go wrong with Superior Nut baskets. Fine quality nuts came in the Gift Basket, however, the Basket was MUCH MUCH smaller than anticipated. I will never spend $40 on this type of gift basket again. Great looking basket. It was a gift for a loved one. It only took a few days for them to get it which really surprised me considering I ordered it like 10 days before Christmas. Great value for the price. Although I did not get to enjoy this gift basket, the two people who did receive it were very happy with the quality. I was very happy with the ease of ordering and the fast delivery. I have sent this basket for every Christmas, Father's day, and birthday for over 5 years now. Cannot be beat!! Very fresh! Very tasty! Just wish there was more. I gobbled them up in two days. Superior Nut has superior quality and top notch delivery!! Superior Nut is my new "Go To" for gifts for all types of occasions, The quality is ALWAYS "superior", the quickness of shipping is always "superior" and the prices are "superior"!! I sent two of these gifts to friends of mine. They both loved them and were very happy for the present. I am quite pleased with Superior Nut Company and would recommend them to anyone. I plan on using them many times in the future. So I bought this as a gift for my dad. This arrived in one day which was faster than expected. When it arrived I noticed it was a little smaller than I thought. So I ate it instead and loved it. Very good gift though to someone who loves nuts. great gift but they did not put our name on card!! Consjust got a note asking 'ARE THESE NUTS FROM YOU?" Repeat customer... great gift product. we sent this and another basket to friends -- they told us they LOVED it! This was a gift for my father and family - he could not stop raving on what a wonderful selection and quality. Thank you - you have made a customer for life. Awesome quality and very good gift basket. I have already bought this gift basket twice. 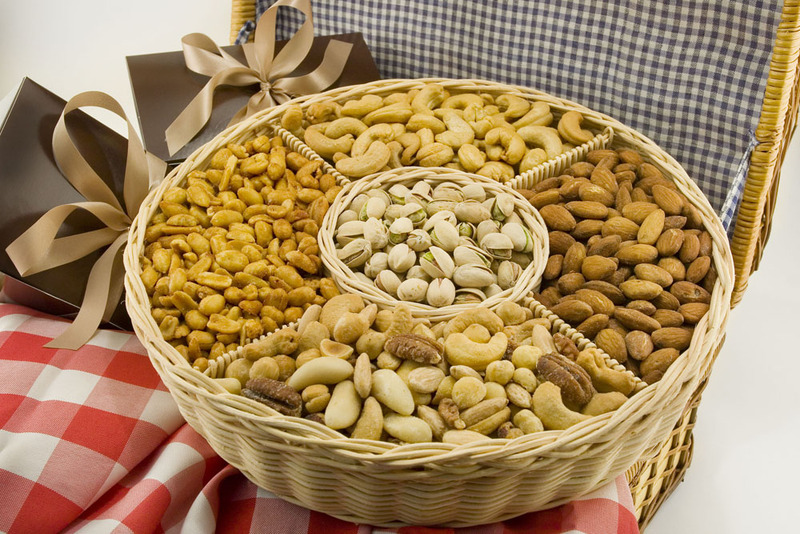 One of the very best nuts gift basket available anywhere online for this price. Strongly recommended. I sent these to my 91 year old grandfather for his birthday. When I ordered them online you indicated they would arrive on 8/17. Perfect, since that was his birthday. Instead the nuts arrived almost 6 days later. Thanks for making it look like I forgot my grandfather's birthday. He did, however, enjoy the nuts and refuses to share them with anyone! Totally irritated they arrived so late. Customer Service is key. Merchant Response:We are sorry that the package arrived late. As you can see when you check the tracking on UPS website, the address information you provided us was not complete; the apartment number was missing. This unfortunately has caused a delay in the delivery. ProsMy grandfather LOVES nuts and the assortment you have is great. ConsDidn't arrive when website said they would. 6 days late. I purchased this product as a gift for my father-in-law and he loved it. I was very happy with the ease of ordering (especially the free shipping) and tracking. I would definitely order from the company again. This basket was a gift for my in-laws who were very happy to receive such a tasty gift. If they were anything but satisfied with it my mother-in-law would have said so. I only heard great reviews from both of them. The title describes how the gifts we sent to family for birthdays and Christmas were appreciated. This month we sent them to my husband's mother's 91st birthday. My husband and I tried some when we visited her. The nuts were fresh and delicious. Thank you for you quality products and service. I got this for my husband for Christmas. He really enjoy it. ProsIt came with all the right nuts, he enjoys. ConsTheir isn't any thing with do not like. I sent these to our daughter's office in LA. She said the nuts were excellent. Thank you. Wonderful! Perfect gift to send and receive! I actually bought these as a gift for my Dad, who loves nuts but who is also very picky about gifts, and never easily impressed. I had them shipped to him and he loved them! he raved about them so I have to think they are something special. Thanks. We bought these as a combined birthday present for our parents. They loved them. Sent this to my dad for fatherâ€™s day. My parents report that they were fabulous. Sir, I have to tell you that I had sent them to my boss who had surgery so many people were sending him flowers and fruit so I did not want to send him those I knew that he liked nuts so let me tell you he said that they were wonderful his wife said that they should have them for dinner that's how good they were. Just wanted to say Thank You! The product is beautifully presented and nuts were very fresh. Definitely , would return to this company in future. We sent nuts to several of our family members and they all loved them. We heard they were big and very good. We will buy from you again. This is a "superior" product from a company with "superior" service. The nuts arrived quickly as scheduled and were absolutely delicious and very well presented. Canâ€™t wait to order again. Well done - left the basket w/assortment on counter during party and everyone enjoyed! excellent service, excellent product! would purchase from again! Your nuts are always a big hit with my parents. I buy them every year for my momâ€™s birthday, but dad has to steal his share of it! I first ordered a "Five Section Nut Basket" for my older cousin's birthday. I was not sure of her diet restrictions but I felt that nuts are generally a good food source as well as special treat.rnI next ordered four of the "Five Section Nut Baskets" after the experience with my cousin. The four baskets are going to Wuhan, China as a Father's Day gift for my future brothers-in-laws in China.rnSuperior Nut Company offers quality gift selections that you feel comfortable with giving to anyone here or abroad.rnThank You!!! It was a huge hit for the staff to receive this gift for a job well done. Everything arrived in good shape and the Nuts were huge! Can't go wrong with this gift.